The ancient icon of Our Mother of Perpetual Help is among the most recognized images of Mary in the world. Generations of Catholics grew up attending weekly perpetual novenas that attracted standing-room only crowds. This golden image of Our Lady has spread worldwide on prayer cards, medals, in colorful framed prints, on booklets, bumper stickers and pocket calendars. Now, this inspiring image and this time-honored method of prayer are just a tap away for iPhone and iPad users. 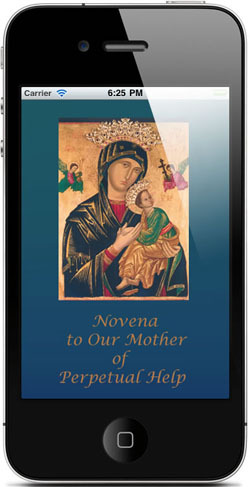 The OLPH Novena app invites the user to pray with the icon for nine days. Each day’s prayer, written specifically for the app by Redemptorist Father John Hamrogue, is both a meditation on the icon and a call to personal conversion. Prayers can be shared via email and Facebook. The app is available from the iTunes App Store for $0.99. The original icon of Our Mother of Perpetual Help, which hangs above the main altar in the Redemptorists’ San Alfonso Church in Rome, dates from at least the 14th century. According to legend it was stolen from a church in Crete where it had a reputation for being miraculous. The icon was eventually displayed in a church run by the Augustinians, but it fell into obscurity in the late 18th century. It wasn’t until the mid-19th century that a young Redemptorist who had grown up with the Augustinians remembered the icon and encouraged the Redemptorists to display it in their new church, which was built on the site of the icon’s original home.